The organ was restored by Edward Bennett in 1988 for The National music Museum, Vermillion, South Dakota, USA http://collections.nmmusd.org/pressler5.html. At that time the organ belonged to Julian Berkeley. He was given it by Francis Lloyd, who inherited it from his mother, Lady Berkeley, who kept it in her house in Assisi in Italy, in a music room which had formerly been the church of San Lorenzo. Lady Berkeley must have bought it at a sale, but there is apparently little likelihood of discovering where without additional evidence turning up. The pitch is slightly less than a semitone below A440. The tuning is a slight variant of Kirnberger III, according to internal evidence and the experience of Friedrich Jakob of Orgelbau Th. Kuhn. In the circle of fifths, c-g-d-a-e are ¼ comma narrow, and the rest are pure. 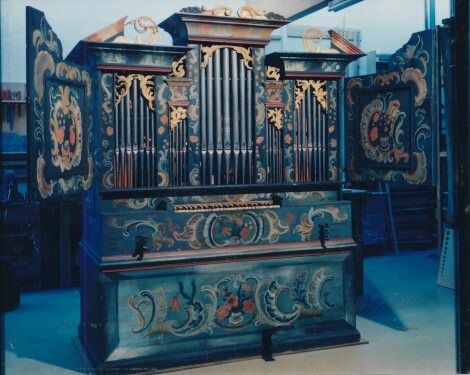 The winding is by foot pedal, which operates a single-fold feeder, filling a two-fold wedge reservoir, The wind pressure is 45mm, at the lower end of the range that are to be found in Toggenburger organs. There is no electric blower fitted. The casework is pine, painted in the characteristic vernacular style of the region, still in use today, a free rococo with stylised flowers. There are fine gilded pierced carvings around the pipe tops and the cornices, which are marbled, rather crudely but effectively. The only significant decoration to the pipes is a highly elaborate pattern, with initials and date, scratched on the central pipe.